NETWORK FINALS: SUNDAY NIGHT FOOTBALL adjusted to 5.8, down 0.7 from last week’s finals. CABLE HIGHLIGHTS: Neither of the night’s prestige premieres fared well. HBO’s MY BRILLIANT FRIEND barely made the chart at 0.05, with CAMPING up 0.03 to 0.08, SALLY4EVER up a tick to 0.04/142K, and the season finale of LAST WEEK TONIGHT down 0.03 to 0.21. On Showtime, ESCAPE AT DANNEMORA was also at 0.05, with RAY DONOVAN down 0.03 to 0.15, and the premiere of ENTMIES at 0.03/175K. A&E’s limited series THE CLINTON AFFAIR had a stronger launch at 0.21/0.20. Although AMC’s THE WALKING DEAD led Sunday cable, it was down a hefty 0.22 to a new low 1.80, with TALKING DEAD up 0.04 to 0.77, and HISTORY OF HORROR down 0.02 to 0.14. Hallmark’s movie CHRISTMAS EVERGREEN was at 0.74. Nickelodeon’s SPONGEBOB ticked down to 0.35. Adult Swim’s DREAM CORP LLC was at 0.29/0.25, compared to last week’s 0.34/0.30. BBCAmerica’s DOCTOR WHO climbed 0.07 to 0.25. Starz’s OUTLANDER ticked up to 0.14. 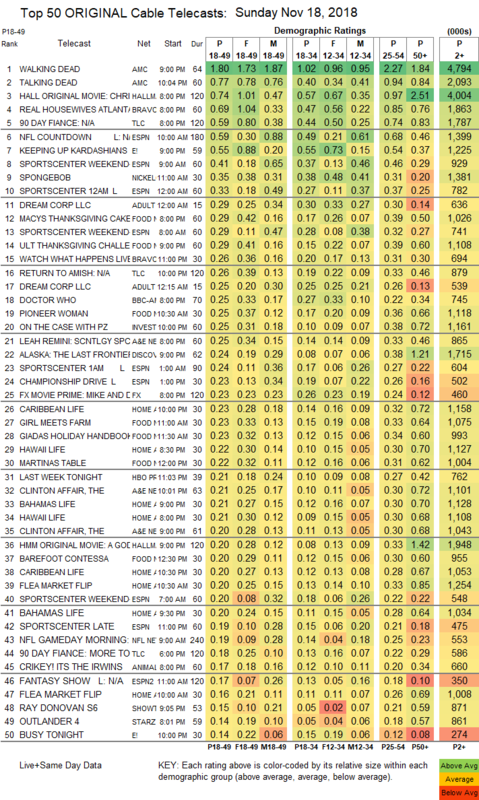 Bravo’s REAL HOUSEWIVES OF ATLANTA topped unscripted, down 0.05 to 0.69. 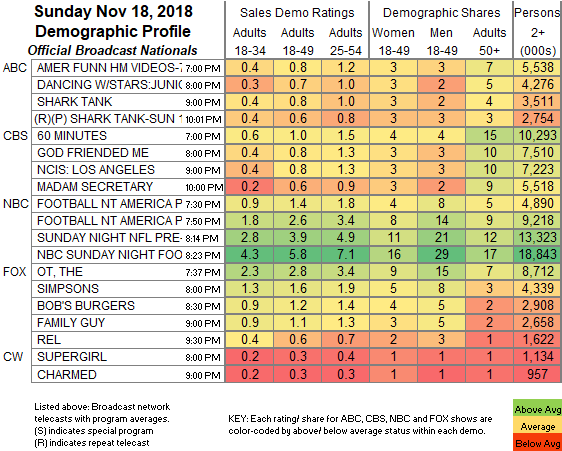 On TLC, 90 DAY FIANCE gained 0.03 to 0.59, and the season premiere of RETURN TO AMISH was at 0.26. On E!, KEEPING UP WITH THE KARDASHIANS was at 0.55. On Food Network, MACY’S THANKSGIVING CAKE was at 0.29, and ULTIMATE THANKSGIVING CHALLENGE was down 0.03 to 0.29. On ID, ON THE CASE ticked down to 0.25. On Discovery, ALASKA: THE LAST FRONTIER dropped 0.08 to 0.24. HGTV’s line-up was led by CARIBBEAN LIFE at 0.23/0.20, compared to last week’s 0.21/0.20.